Through the multi-disciplinary world of arts, it can bring new perspectives to people, on how they view, interpret, understand and learn about the world around them, the different cultures and belief systems in different societies around the world. 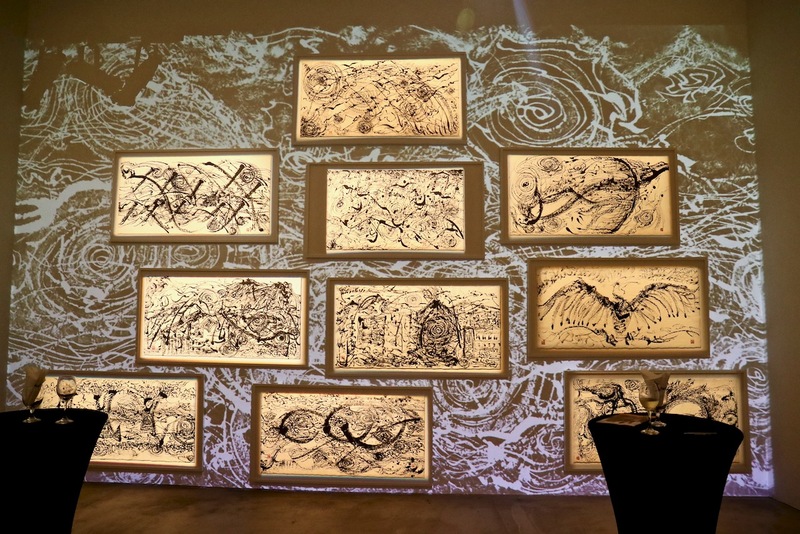 Bridging Realms at the Esplanade – Theatres on the bay presents four exhibitions around Esplanade, one of the exhibitions is Ink Mountain, 墨山, by artists Mark Chan with Brian Gothong Tan. 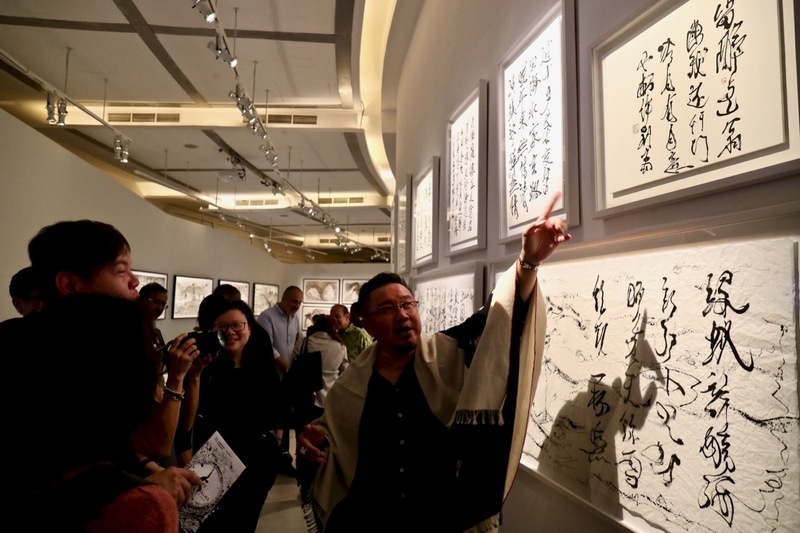 Ink Mountain, 墨山is not your usual conventional Chinese calligraphy artworks or traditional ink painting exhibition. Upon stepping into Jendela (Visual Arts Space) where this special and unique exhibition is held, visitors enters into the realm of Mark Chan, he is a very talented artist in the fields of composer, lyricist, librettist, poet, painter, singer, songwriter, multi-instrumentalist and author. 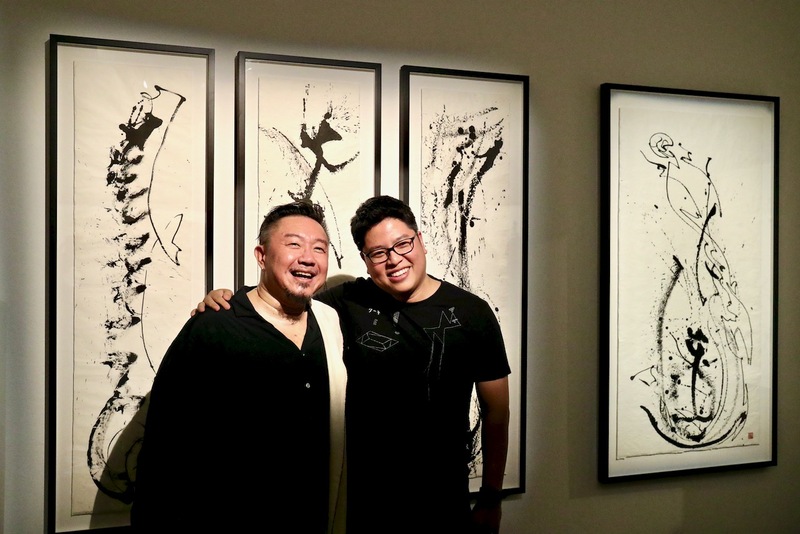 Mark Chan’s personal and unique artistic vision of the world can be seen on his ink paintings and bold Chinese calligraphic brush strokes that are not in the norms of traditional ink painting standards. When you are visiting this exhibition, do not rush, take it slow and easy, and observe closely, can you spot the mythological creatures and spirits present in his paintings? Walking along inside the Jendela, do you observe moving video projections on the walls and floor of the Jendela? Mark Chan collaborates with Brian Gothong Tan, whose video works show another side of Mark’s paintings, revealing new layers and perspectives in an enclosed sanctuary inside the Jendela, away from the world outside. 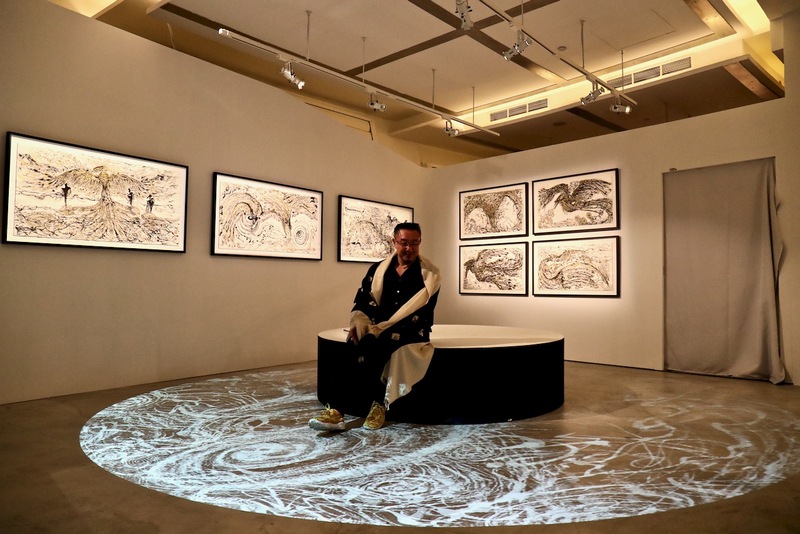 This blends and fits in perfectly with the artworks installations on display, Mark Chan’s bold calligraphic strokes with his personal idiosyncratic artistic talent and techniques that is beyond the world that we live and see everyday. 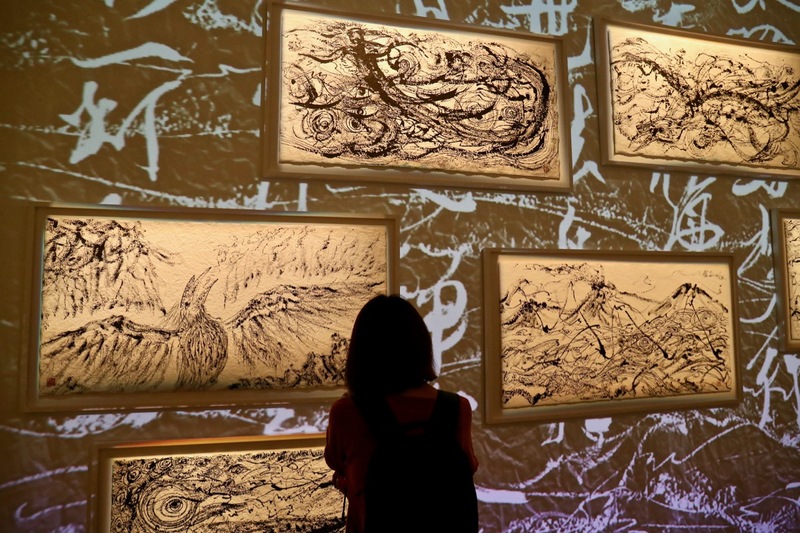 Ink Mountain, 墨山, is immersive, special, unique, compelling and deeply connected in its own realm of the two great artists at work. Some visitors might take a bit more time to immerse themselves into the realm of Ink Mountain. Do not fret, do not rush, welcome to the complex history, culture, language, diversity and character of Southeast Asia, displayed through the world of Ink Mountain by Mark Chan with Brian Gothong Tan, bridging realms between yourself and Ink Mountain. I was there with a group of friends on the evening of 17th January 2019, thanks to Belinda Tan for extending the official opening invite to us and we got the opportunity to meet and speak to the two artists, Mark Chan and Brian Gothong Tan. 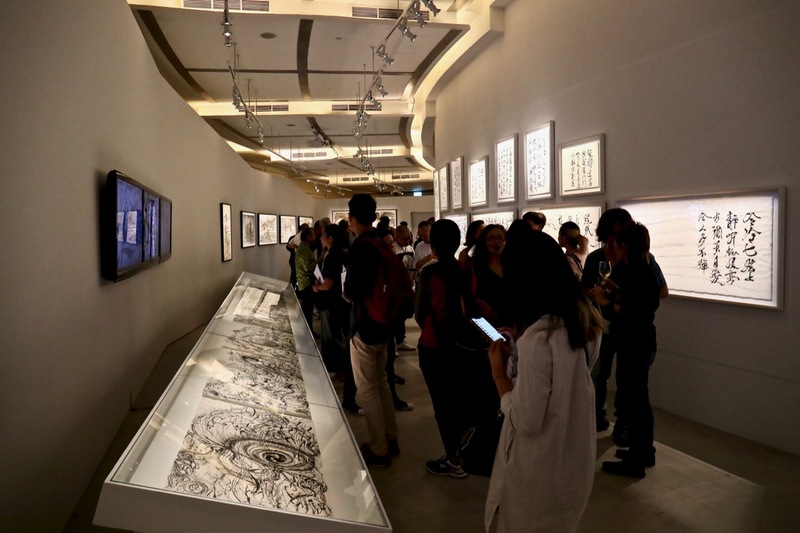 It was a big opening event with awesome attendance, a great testimonial to the multi-talented artist Mark Chan. I would like to sincerely thank Mark Chan for giving us a short artist tour of his amazing works on display, I would like to apologise to Mark Chan if we were falling behind while we were on his artist special tour for this group of ours, we were all trying hard to “play catch up” with his teachings and sharing! I have to plan another visit back to Ink Mountain again; there is an aura and mystical mystery that is drawing me back to immerse myself again, discovering answers that I am searching for, through the ink paintings, just like the large jade bird mythical journey and the three volcanoes. Maybe I am searching for my own Bridging Realms at Ink Mountain?